Asylum seekers and refugees detained in a remote Pacific camp were awarded Aus$70 million ($56 million) Wednesday for being illegally held and treated with negligence, in Australia's largest human rights class action settlement. But conditions in the camps have been widely criticized by doctors and refugee advocates, who say some asylum-seekers have suffered mental health problems due to their prolonged detention. The compensation package was approved by Victoria's Supreme Court on Wednesday. Nauru was not involved in the legal case. The Manus center is due to shut next month after a PNG Supreme Court ruling last year declared that holding people there was unconstitutional. Lawyers for the group participating in the settlement said they hoped to get the compensation to them before the closure. "These detainees came to Australia seeking refuge, compassion and protection, which were all denied to them by successive Commonwealth governments," said Rory Walsh of law firm Slater and Gordon. "Today, the group has finally been delivered justice through the Australian legal system and the Supreme Court of Victoria. "The result that has been achieved in this case -- against significant odds -- will allow meaningful compensation to be paid to group members much more quickly than would otherwise have been the case." Distribution of the settlement will be supervised by the court, with a further hearing in October to determine when payments will start. Some 72 percent, or 1,383, of the 1,923 detainees held at the center from November 2012 to December 2014 joined the class action, with the court approving a two-and-half-week extension, allowing others to register if they chose. While lawyers said most detainees were happy with the outcome, some opted out of the agreement, including Iranian refugee Amir Taghinia who said money was not the most important factor for him. "Getting that money is not the issue," he told the Australian Broadcasting Corporation Wednesday, adding that little had changed regarding his situation on Manus. "We are still in the same situation, we are still suffering from the same conditions. It is absolutely not in favor of any of the detainees in here, but it is in favor of the law firm and the defendant." The government had no immediate comment Wednesday, but has said previously that the payout was not an admission of liability, but to avoid a costly six-month trial. 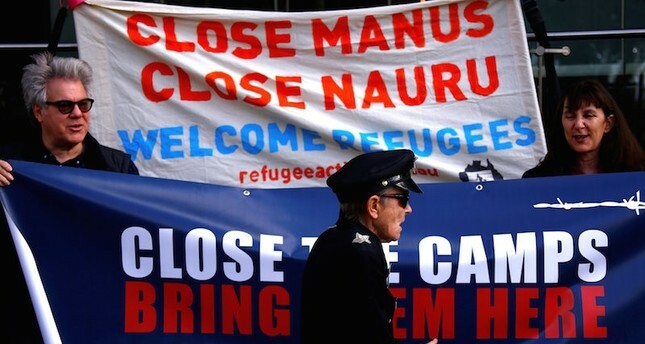 Canberra has said it will move the asylum-seekers and refugees from the Manus camp by October when it closes. Some will be relocated to third countries, or resettled elsewhere in PNG.